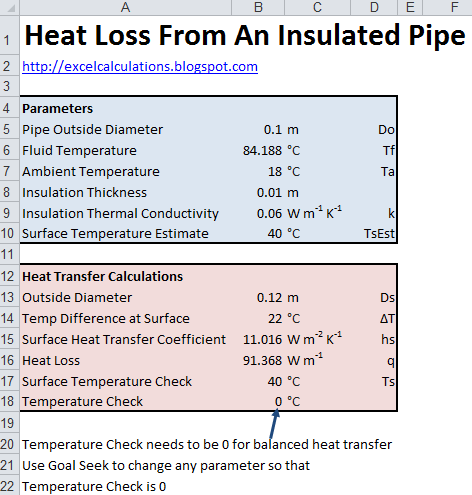 This Excel spreadsheet models heat loss from an insulated pipe. This is a very common system in the process industries - insulated pipes are everywhere, and engineers need a sound grasp of heat transfer principles to model their effects. Although the model in the spreadsheet is simplified to aid understanding, complexity can be easily added. Liquid flows through the pipe, with heat exchanged with the insulation. Heat is lost from the insulation to the environment via convection (no radiation losses are considered). 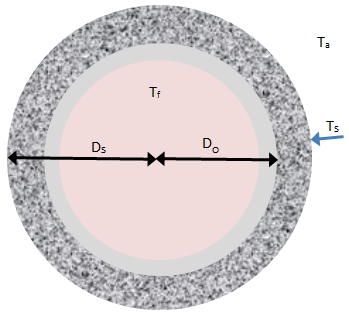 The thermal effects of the pipe wall are ignored (although this can be easily implemented). These equations are used in the spreadsheet to define the heat transfer process. The equation for the surface heat transfer hs coefficient is a correlation; any other valid relationship can be substituted. 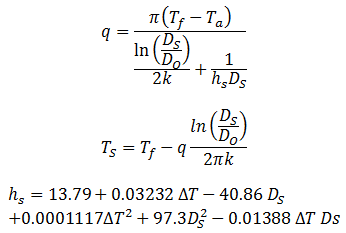 The equations are implicit - the heat transfer coefficient is a function of the surface temperature Ts, but the surface temperature is a function of the heat transfer coefficient. You can easily modify the heat transfer equations to include more complex effects, such as effect of fouling on the pipe surface, multiple layers of different insulation, radiative losses, thick large pipe walls (which act as a heat sink) etc. Thank you for your spreadsheets, they are very useful. I am trying to produce a spreadsheet which calculates the rate at which a cylinder of water can be heated from a coil heat exchanger. I am heating a fluid in a pipe at a rate of 10kW, this fluid travels through a copper coil 22mm diameter inside a cylinder of cold water (300 litres). I've tried adapting your spreadsheet for cross flow heat exchanger, but it only deals with static temperatures into the copper coil and an air temperature. I have heated waste water left over from a processing plant that currently runs to waste. I want to use this heated waste water to increase the air temperature in a warehouse office area. I am thinking of installing a copper pipe a low level around the wall to act as the radiator and then the water will still run to waste. What I want to know is how many watts of heat energy I will recover for space heating and what would the waste water temp drop too before going to waste.